Limericks are short poems of five lines having rhyme structure AABBA. It is officially described as a form of ‘anapestic trimeter’. 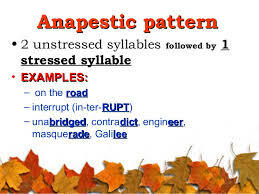 The ‘anapest’ is a foot of poetic verse consisting of three syllables, the third longer (or accentuated to a greater degree) than the first two: da-da-DA. Anapest is a poetic device defined as a metrical foot in a line of a poem that contains three syllables wherein the first two syllables are short and unstressed followed by a third syllable that is long and stressed as given in this line “I must finish my journey alone.” Here the anapestic foot is marked in bold.